Where is the clipboard in the Android phone? How to use it? Greetings to you, dear reader, today I will tell you what the clipboard in the Android mobile gadget (phone or tablet) is, where it is and how to use it correctly in order to easily copy and paste pieces of text into necessary places. . But, first of all, I’ll give the definition of a clipboard so that you understand what we are dealing with. The clipboard is the part of the memory that stores the copied information (in this case it is the text). Used to copy and paste the necessary parts of the text. Working with the clipboard in Android (phone or tablet) is very simple. Below is a detailed instruction on this issue. To master this information you will need a maximum of five minutes. So, let's begin. 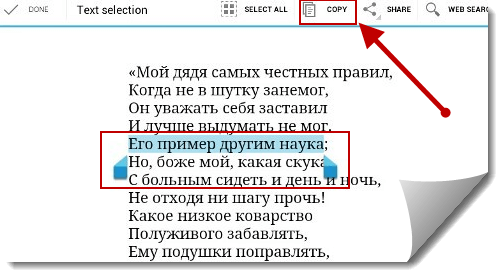 After you have selected the text fragment you need, you need to find the button (screenshot below) “Copy (Copy)” and press it. Sometimes the button is accessible from the toolbar, and sometimes it appears in the selection area. If you did everything correctly, the selected text will be copied to the clipboard on your Android gadget (Samsung, etc.). Now it remains to make the final touch - click on the “Insert” button. It may be located in the toolbar, and may appear in the click area. I think you do not miss it, it is very noticeable. Today I have everything, I hope you could figure out how the clipboard on the Android gadget works (for example, the Samsung phone). If the article was useful to you, I would be grateful if you leave a comment (the form is below), and also share a note in your accounts on social networks, such as VKontakte or classmates. Well done class that showed how to figure it out. After copying, the text is saved in the clipboard and to paste it in the right place, just call the function "paste"
I insert what was last copied to the buffer. How to log in to get the previously copied text? Thank.